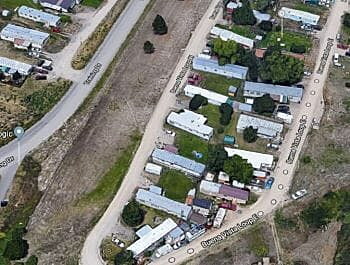 Missoula County commissioners on Tuesday asked the state for another six months to procure an engineer for the second phase of a wastewater project planned for a mobile home park west of the city. Sindie Kennedy, a grants administrator with the county, said the need for extra time came after the project’s first phase encountered a delay, slowing plans to install a lift station at the Buena Vista Mobile Home Park. Located west of Missoula International Airport, Buena Vista represents a collection of 36 mobile homes that sit above a nearby sewage lagoon. The environmental impacts of the unlined lagoon and questions over public safety have placed Buena Vista high on the priority list for a new treatment system. Over the past few years, Missoula County cobbled together funds to move the project’s first phase forward, which is estimated at roughly $470,000. But when Phase 1 bidding was opened in July, it netted just one contractor and was $100,000 over budget. Kennedy said an invitation to bid will be reissued later this year, with Phase 1 construction starting next spring. Phase 2 would be contingent on the outcome of Phase 1. The current wastewater system at Buena Vista flows to an unlined lagoon at the bottom of a draw that once served as a tributary to La Valle Creek. The mobile homes within the park are each connected to an 8-inch main that sends sewage to a diverter and into the lagoon. But officials believe the lagoon is leaking waste into the groundwater. They also believe the effluent is flowing into the natural drainage and working its way into the Clark Fork River. As proposed, the lift station included in Phase 1 will replace the diverter and send effluent to a sewer line planned at Training Drive. The line will then carry waste to the city’s main sewer line at Airport Road. If Phase 2 funding is secured, Kennedy said, individual mobile homes would then be connected to the new sewer line. Additional services could also be placed nearby to expand the mobile home park, which is owned by the residents.